Some Kind of Star Trek: Star Trek Into Darkness: Where's Scotty?! One more day struck from the countdown and just a few bits to highlight today. 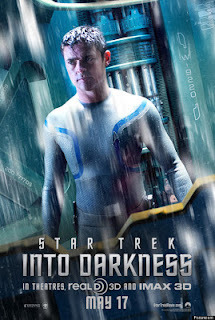 Just as the day in the UK was drawing to a close we were treated to a new McCoy poster as well. Different again, this looks more as though it's "set" during the early section of the movie with the good doctor attired in that rather fetching silver away mission suit. No fear, it's already on my Christmas list. 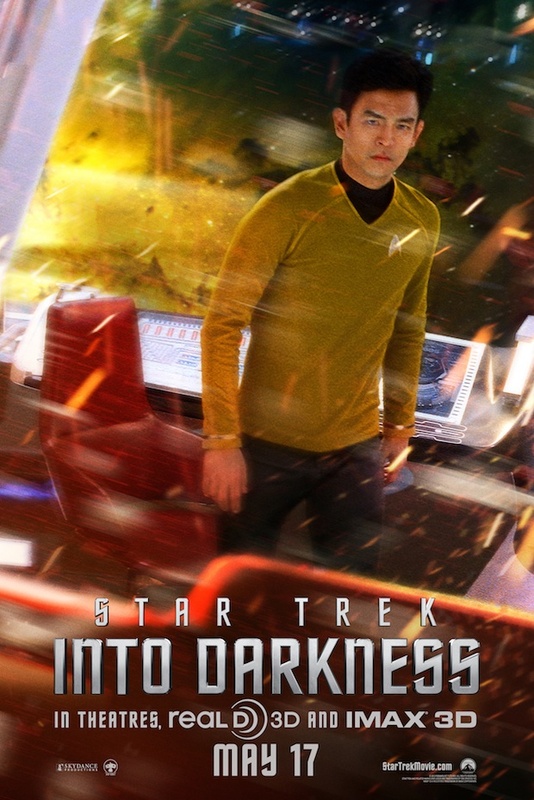 It's a good shot although I'm not sure where it's supposed to be - is this just after he's clambered back onto the Enterprise after taking a running jump off the cliffs? If you've got keen eyesight I'd recommend you get yourself over to Paramount Pictures UK and check out their Search for Scotty poster campaign which could win you tickets to the world premiere of Star Trek Into Darkness on May 2nd in central London. 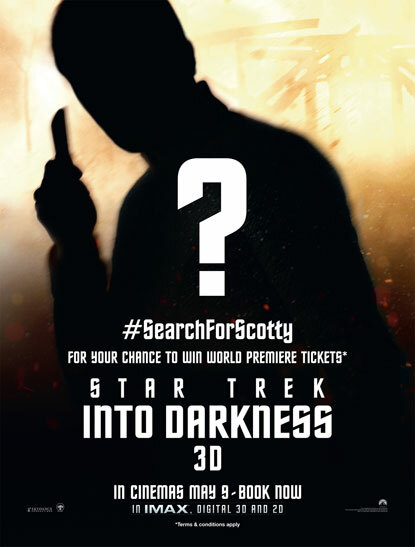 Find one of the Scotty posters before Harrison does, enter the code that's displayed into the site and you could be there for the Big Event. If you spot one of these, send me a picture or drop a link to it - I've only got the website one to go by and here it is so you know what you're looking for - if you find the locations start sharing them!!! Now this does suggest that the reason Simon Pegg's engineer wasn't prominent within the marketing so far was because of this new twist. 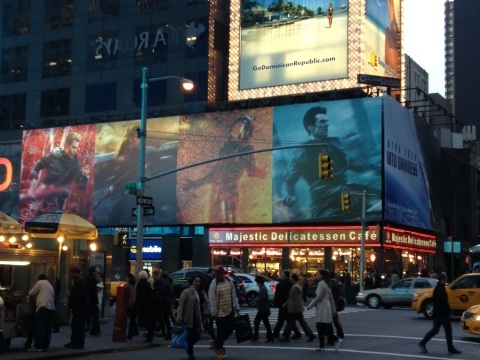 Clever move, Paramount and it's keeping the promotional juggernaut in motion. Talking of that, now they've done Australia and Moscow, the Star Trek Into Darkness premiere machine is moving to the City of Love and Romance, Paris (pic below from Moscow from startrek.com). 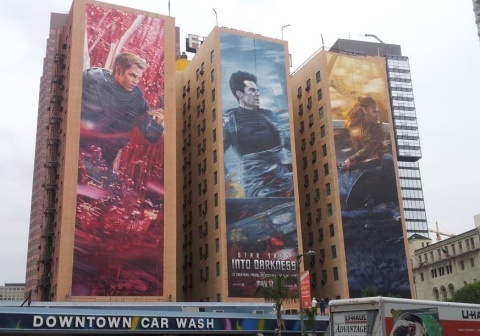 Over in the US there's also life being breathed into the campaign trail with these buildings (top) draped in fetching character posters ready for mid-May - no space for Spock here though however he is managing to show his face along with the plummeting Enterprise (below) on Time Square!!! It's all getting very real now isn't it and not that long ago we were getting hot under the collar over some poster of Benedict Cumberbatch looking across a desolate city....still waiting for the Uhura/Harrison viral to hit the internet as well as some more character posters. Are we going to get any mega-surprises in the next few weeks? Has anyone uploaded anything to the #1701? Let me know your thoughts! Just while we're looking at the immediate future, what's JJ going to be doing next? How is Star Wars going to affect his time with Star Trek? At the moment and according to this article on Hitflix he'll consider it at the least - but do you think the franchise could manage another change of director? I think we'd like to see him in a producing role at the very least but it can't be easy when you're in this much demand between the biggest two sci-fi/fantasy franchises in the known universe! 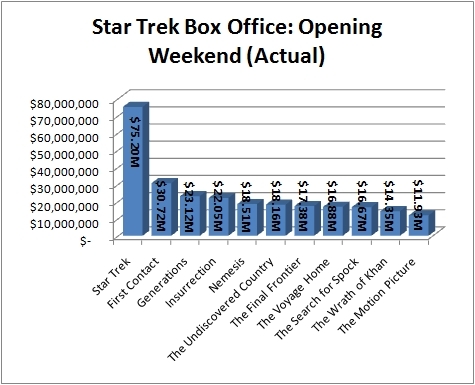 For those of you who like a good number crunch at lunch, here's the opening weekend figures from the Star Trek films courtesy of Variety magazine. There are expectations that the $70 million the 2009 reboot made will be blown wide open with $90 million from Star Trek Into Darkness. It's also got a PG-13 rating too as was expected. Means you can drag the kids along now with no excuses - some violence but that's what you'd expect! The big challenge will be to see how the film traverses the Atlantic as traditionally it's not done that well away from the USA - probably hence the Scotty marketing campaign (above). If you like your Star Trek Into Darkness merchandise I can thoroughly recommend stopping by Cultbox and see if you can win yourself the Revell model kit of the new USS Enterprise from the movie. I think she's a beauty and would probably kill a few targs to get hold of one. All you'll need is a Twitter account, follow Cultbox on Twitter and retweet the following text: Follow @cultboxtv and RT for a chance to win a 'Star Trek' U.S.S. Enterprise model kit - Info: http://bit.ly/YYhWZ0 #TrekCB and you could be in with a chance!!! The winner will be selected at 11:59pm on Monday 13 May 2013. This will be updated during the day so check back!! !